Molly’s surrogate wanted to give her impending mom a special new baby gift to honor and celebrate the journey they traveled together. Surrogacy jewelry celebrates the strength, patience and love for the wonderful people involved in the journey to result in a very wanted new life. 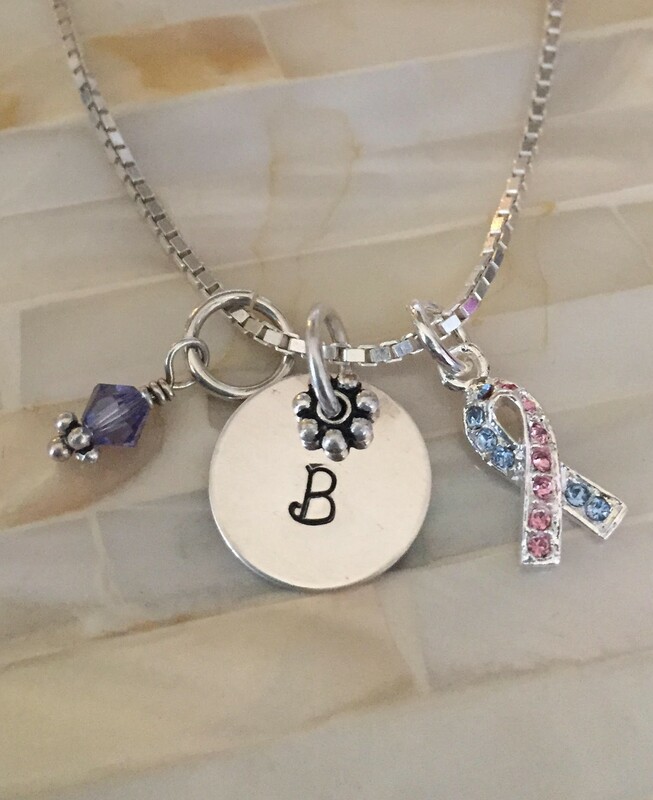 She selected a double-layered personalized family name necklace and personalized the charm with “Loved by Many” on the bottom charm and Molly’s name on the top charm. 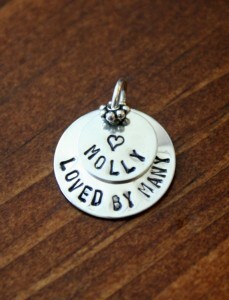 We hope Molly’s mama loves wearing her new personalized mom necklace. Congratulations! After struggling with infertility, Suzanne was inspired to create jewelry gifts to support miscarriages, pregnancy and infant losses. Each Memorial & Remembrance custom jewelry order we receive is dear to our heart because this cause is so close to us. This sweet personalized infant loss necklace was customized for a special mom who lost her baby during the third trimester. She wanted to wear a simple design that was hand stamped with the baby’s first initial, birthstone and ribbon charm to support and raise awareness for Pregnancy & Infant Loss. Visit our Memorial & Loss Designs to create a remembrance gift. If there is a special quote or phrase you are looking for, contact us at(913)583-0118 or kandsimpressions@gmail.com for assistance.